Thirties of the 4th century. Reworked in the early 19th century by the master Benedetto Pistrucci. 18.5 × 12.2 cm. Saint Petersburg, The State Hermitage MuseumInv. No. Ж 146. 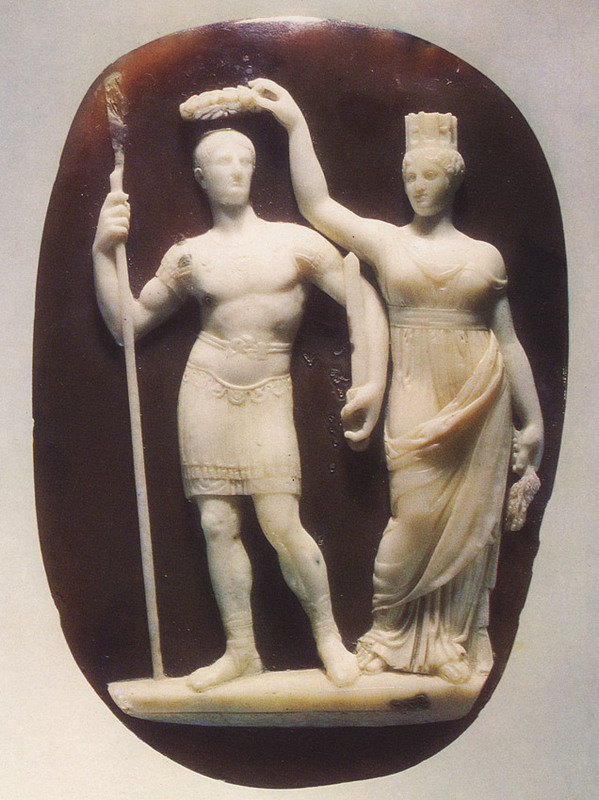 Constantine the Great and Tyche of Constantinople. Stefani, Putevoditel, str. 73; M. Maximowa, Der “Trajankameo” der Ermitage, JDI, 1927, S. 299; R. Delbrueck. Spätantike Kaiserporträts, Berlin, 1933, S. 130, Abb. 32; G. Bruns, Staatskameen des 4. Jh., 104. Winckelmanns-programm, Berlin, 1948, S. 29, Abb. 25. © 1971 Photo, text: Neverov O. Antique cameos in the Hermitage Collection. Aurora Art Publishers. Leningrad. 1971. P. 95, pl. 106.